Recently, I spotted this delicious looking cocktail on Pinterest. It combines everything I love in a glass. Seriously. I mean, is this not the perfect summer sip? 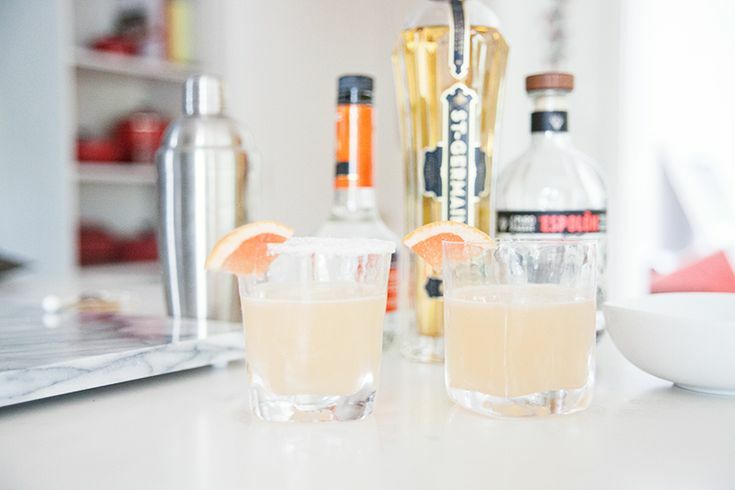 Combine tequila, Triple Sec, St. Germain, grapefruit juice, lime juice, and honey in a cocktail shaker with ice, and shake shake shake. This sounds amazing, oh my goodness! This looks delicious! Yes, I want to come over for drinks! I absolutely love champagne and St. Germain so I will definitely be giving this one a go - after I pop this baby out next week, that is. Even the name sounds good - the pictures make it look even better! Oh my, this sounds delicious and looks so pretty! Done, need one of these! This sounds so refreshing - need to make this soon! Haha, I love opportunities to pin a great drink recipe before noon! Yum!! My drink of choice right now is a Mexican Mule .... Same goods as the Moscow but with tequila instead. It is.....beyond! Be right over!!! Grapefruit cocktails are my favorite and this sounds amazing. Might have to shake these up for the holiday weekend. this looks great!!! I have been hearing so much about Elder flower these days and what a great cocktail to try! Thanks so much for the recipe love! This is right up my alley! Sounds delicious. I am all for anything citrus!